Establishing a Green Bank or Greening an Existing Bank? This paper examines the relative merits of starting a de novo Green Bank compared to “greening” an existing National Development Bank (NDB). The report starts with a brief analysis of the general problem that demand for financing of green investments exceeds existing supply, including a description of key financial and non-financial barriers to investment. 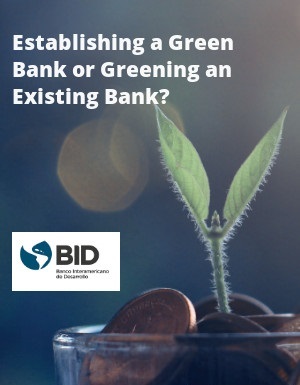 It then presents the question of whether to green existing NDBs or grow a de novo Green Bank, and identifies criteria from institutional, government, and economy-specific perspectives to help inform the decision. Finally, this paper outlines a basic process for how to ‘green’ a NDB, should that path be chosen.